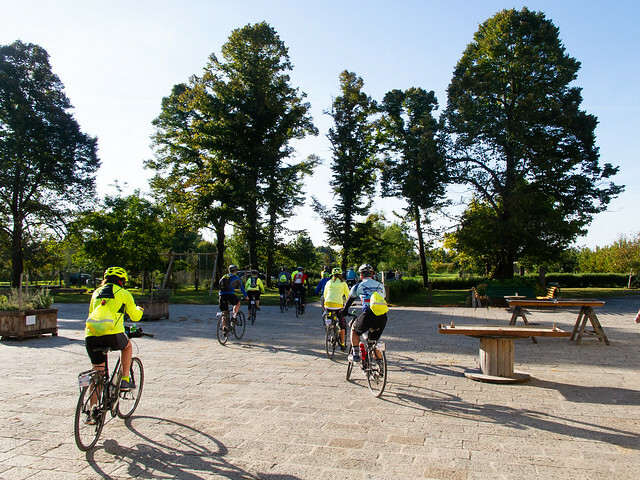 On a lovely morning we rolled out of the agriturismo and back to the levees of the Adige River. 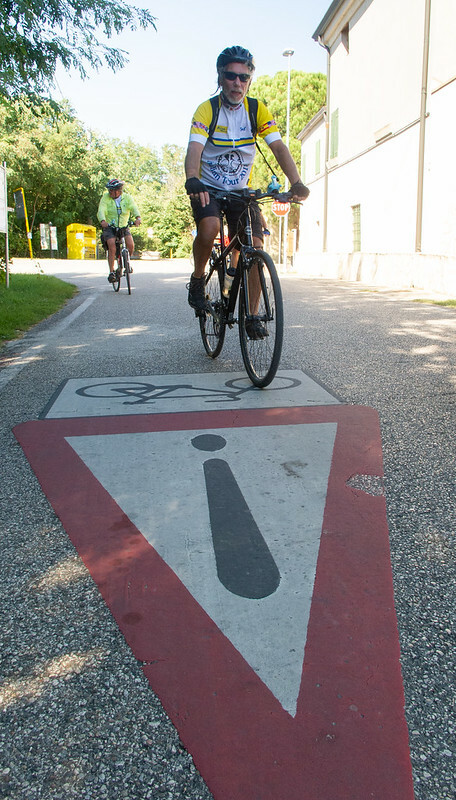 It was nice starting with such an easy, pleasant ride, and I had a number of good conversations rolling along on the car-free paths. Some were still grumbling about the gravel but I personally was really enjoying it and had a number of great conversations riding alongside our tour companions. 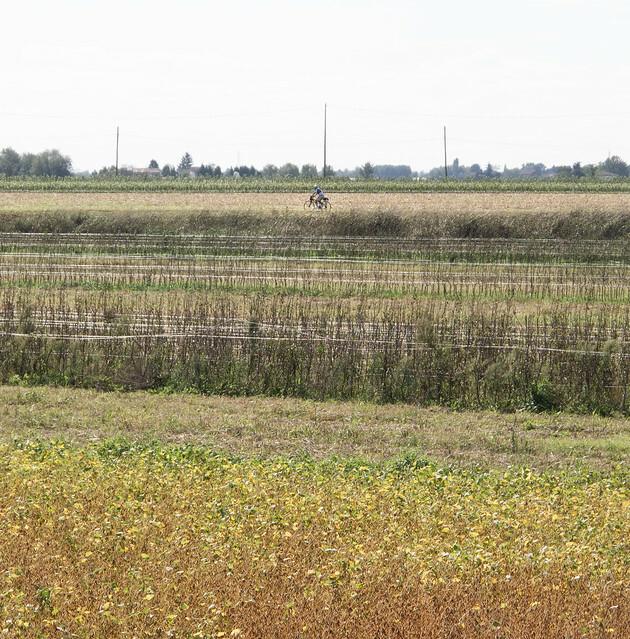 After passing Lusia (not Luisa, one of our Italian riders), we turned south from the Adige River and headed across the delta towards the Po. This put us back on the pavement (mostly), but the area was very rural and the roads were still very quiet. We had a tour at Villa Badoer (c1554), one of many villas in this area of Italy dating to the era of the Venetian city-state. 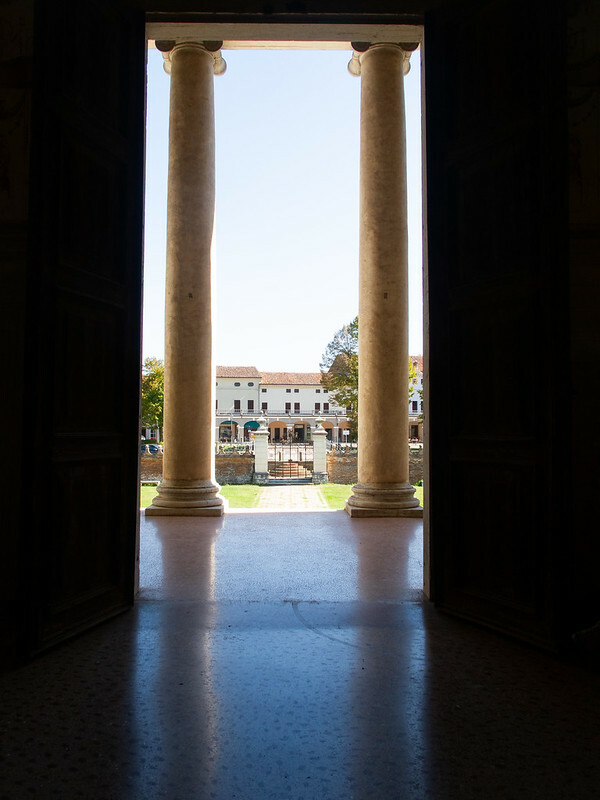 It is significant in that it was built by Palladio, thus making it an early example of the neoclassical style which would come to dominate Renaissance architecture. After lunch in Fratta Polesine, we got back on the road. 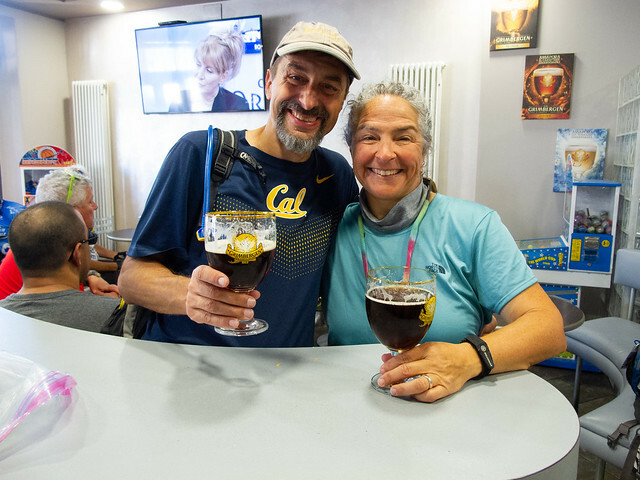 We had to navigate through an areas where we had to cross major roads, and at one of these we had what would turn out to be Best Biff of the trail, as one of our Mary Anns (we had two) caught her handlebar on the bike path pole after crossing the road. She fell kind of hard and hit her (helmeted) head on a trash can, but she was OK. For the rest of the trip we’d hear many loud calls of “POLE!” as we navigated the bike paths. We had one more rest stop at a cafe in Polesella. It was definitely beer o’clock. 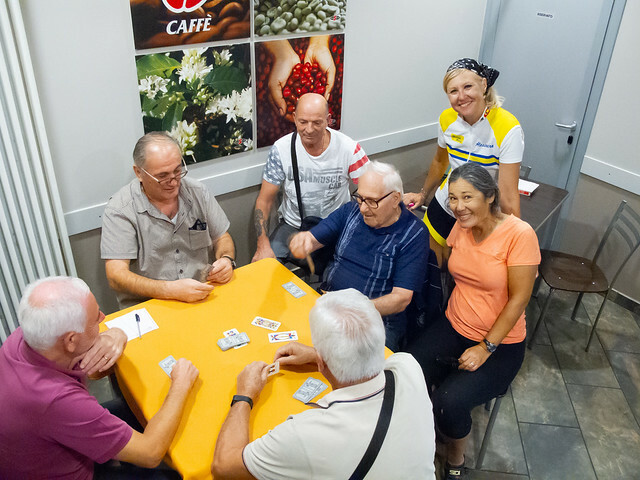 Grace and Alessandra had to get some pictures with the old Italian guys playing rummy. I think they were mutually charmed. 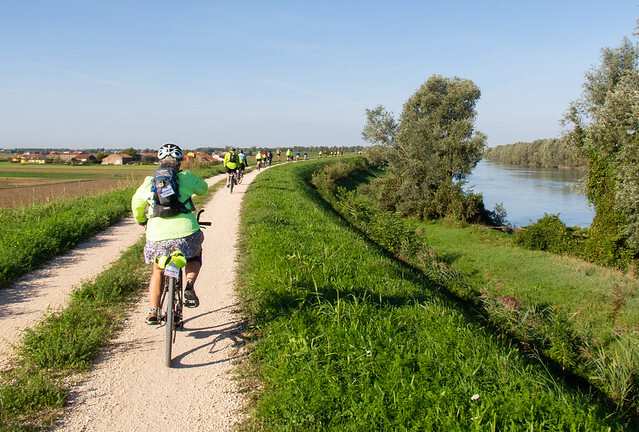 After Polesella we crossed the Po River into the Emilia Romagna region. The crossing was on a busy bridge, but then our route returned to the quiet levee pathway as we rode towards the sunset. 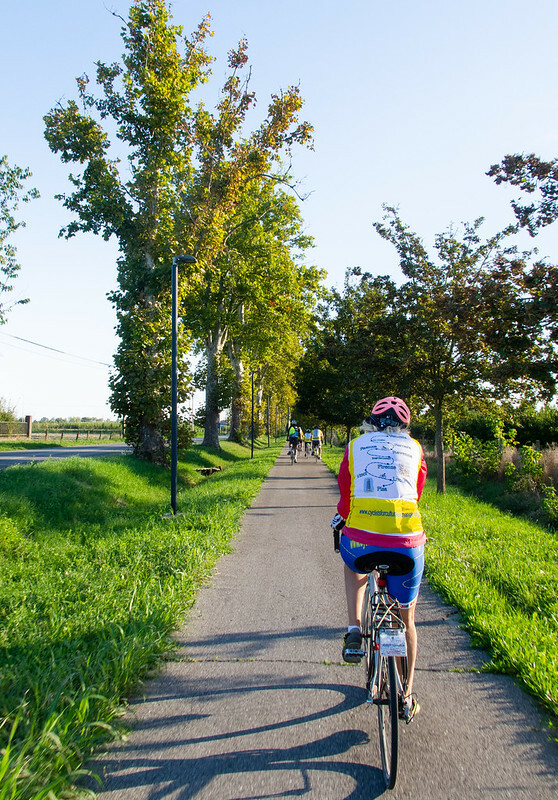 We turned south towards Ferrara and got into roads with a bit more traffic, but not too much to be able to enjoy the ride. 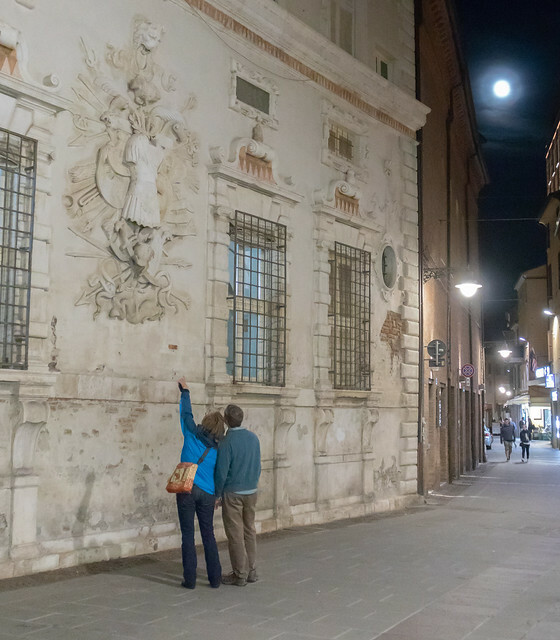 We were a bit behind schedule because of some mechanicals, so when we got to Ferrara proper we rode through the hectic streets, and walked our bikes directly through the castello, until we reached our hotel on the other side of town. We had dinner at a restaurant in town, and got to walk the charming streets looking for (and finding!) gelato. 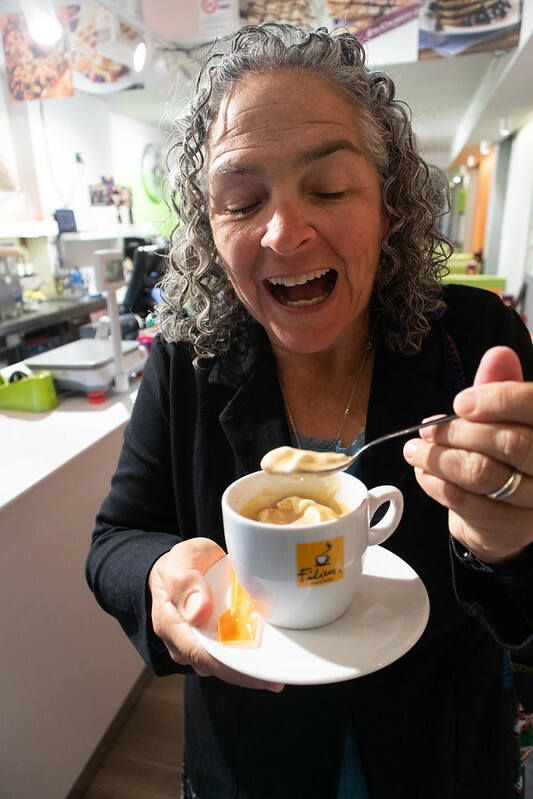 (Nancy got her favorite, an affogato, kind of an espresso float). We headed to bed fairly early, as tomorrow was going to be our longest day.